This cover went into the mails in Callao. Callao is adjacent to Lima on the Pacific Coast of Peru. There are two Callao CDS which appear to be dated October 29 on the front. However, the rear has a purple double circle CDS for the U. S. SHIP MONONGAHELA dated October 28. The Monongahela was a steam screw sloop commissioned in 1863. Her engines were removed in 1883-84 and she was assigned as a supply ship inCalloa. 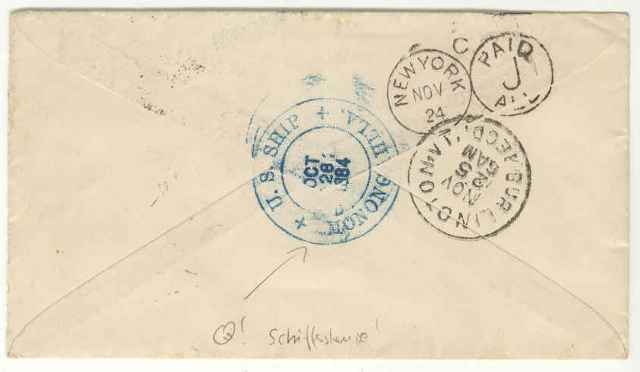 The cover has a binocular transit from New York city dated November 24. 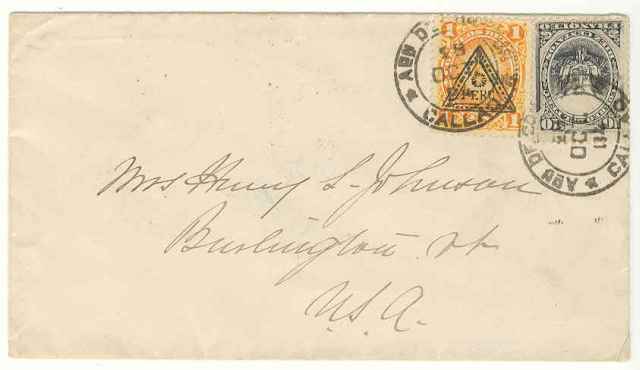 The cover was marked as received at its destination of Burlington, Vermont, on November 25. Burlington is in the northern part of Vermont, only about 50 km from the Canadian border. The stamps are from the 1874-84 embossed with grill issue. The 1c orange Sun God of the Incas with black handstamped overprint was issued in 1883 (Scott 65). The 10c slate Coat of Arms (placed upside down on this cover) was issued in 1884 (Scott 26). It would be interesting to be able to see the grills in detail on these stamps.